She felt as if Donald Trump was empowering people to be bigots. And so when he won the presidency, she resolved to do something. The first Women's March was one of the largest protest days in American history. It was held the day after Donald Trump's inauguration and created a euphoric moment of unity for many women, like Beem, who were disillusioned with the election results. Now, some are disillusioned with the Women's March movement itself. Beem became the president of the Washington state chapter of Women's March, but her local chapter is dissolving at the end of the month. Beem says they're shutting down because of a disagreement with the national leadership of the movement. This Saturday, when women take to the streets for the third annual march, the protest will be seen as a referendum on a bigger, existential question for Democrats: Is it possible to keep a "big tent" together ahead of the 2020 presidential election? Beem says her group is breaking up because they could no longer support the national co-chairs of the movement. "They're anti-Semitic," said Beem. "I mean, they claim they aren't. But they are. They're being racist." Beem's accusations are a part of a long and complicated controversy. In February of last year, Tamika Mallory, one of the co-chairs of the national march, attended an annual gathering held by the Nation of Islam in Chicago called Saviours' Day. Louis Farrakhan, the leader of the Nation of Islam, has been known for anti-Semitic remarks, but his defenders say the Nation of Islam has also done important work for black people in neglected communities. Mallory herself has talked about the positive role the Nation of Islam played in her life as a single teen mom when her son's father was murdered. However, the Southern Poverty Law Center considers it a hate group. 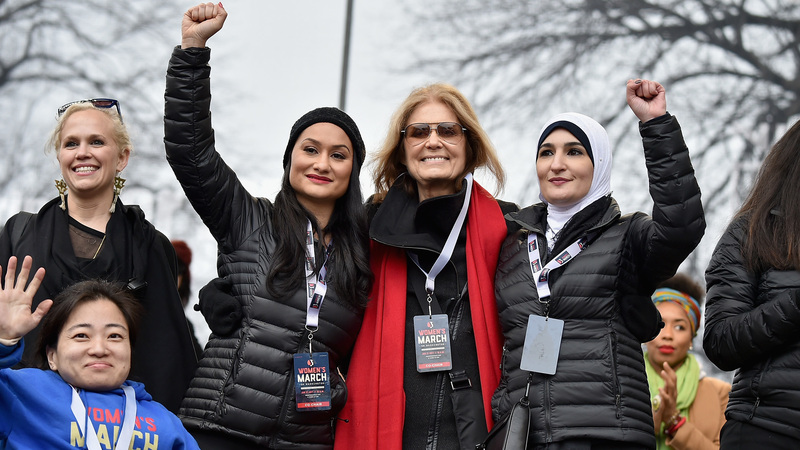 Another national Women's March leader, Linda Sarsour, has been repeatedly criticized for being an outspoken critic of the United States relationship with Israel. Sarsour says the leaders of the movement have been "crystal clear" in rejecting anti-Semitism and racism. They've also acknowledge that Farrakhan has made "hateful" remarks that don't align with their principles, but she says the fact that they are blamed for Farrakhan's comments feels like they're being stripped of their own agency. "People are asking us to take responsibility for commentary made by someone else, and in particular a man, which is actually quite antithetical to feminism," Sarsour told NPR. "We have our own agency; we should be judged by our own work." There is no doubt that some women feel unwelcome at this year's march, but Democratic pollster Anna Greenberg says this talk of a broad-based schism in the Women's March irrelevant to most women, and even elitist. "I'm not dismissing or diminishing some of those divisions," said Greenberg. "And it may lead to less enthusiasm among some people, but there's a whole other swath of less engaged people who just want to come out and march." Greenberg says people are frustrated with President Trump and his policies, and they want a way to express that frustration. "Everybody's united by one thing, and that is Donald Trump," she said. Sherri Masson, a retired public school teacher from Michigan, is one of those women. She leads a local Indivisible group in a conservative Detroit suburb. "We decided the Women's March was larger, was bigger than a small group of people that were organizing it," said Masson. She's still making the trek to Washington, D.C., with a group of local politically-active girlfriends, in part, because that first march was inspirational. Masson says women who had never volunteered for an election before decided to make calls and knock on doors during the midterms. "It answered that question that people had the morning after the election: 'What can I do? Oh my gosh, we have to do something,'" she said. "And I think it sort of gave us that something"
As for Sarsour, she's not disheartened by the controversy. She considers it "growing pains." She says the women's movement, let alone the Democratic Party, has never presented a united front. "I think the Women's March is actually reflective of this idea that you can create a big tent, but that doesn't mean the people inside of the tent are going to agree on everything," she said. "In fact, they might have very public fights about the things that they don't agree with." "[The Women's March] was a distinct departure from old definitions of the women's movement, which would choke out participation from someone like me," said Aimee Allison, founder of She The People, a group whose mission is to elevate women of color nationally. "It wasn't just about abortion rights. It was about criminal justice and immigration." Both Allison and Sarsour say the strength of the current movement has been its diversity, and even if trying to create a multi-racial coalition is messy, they feel like it's progress that people are trying. They insist the Democratic Party needs to prioritize issues like racial justice and immigration more than it's done in the past if it wants to remain relevant. Democrats inherently have a harder job keeping everyone in the party satisfied, according to Lanae Erickson, senior vice president at the centrist Democratic think tank Third Way. She says the party is more ideologically and demographically diverse than the GOP, so there are bound to be more disagreements. "It's just a matter of Democrats needing to herd cats a little bit more than Republicans have ever have had to," she said. Despite the challenges in creating that unity, Erickson says the first Women's March in 2017 offers an instructive guide, because all kinds of women were protesting simultaneously, for different reasons, under one umbrella. "I think the Women's March was one of those things that was kind of like Barack Obama, it could mean to you whatever you wanted it to mean," said Erickson. And that's a lesson she hopes Democrats keep in mind ahead of 2020.